Barely a stone’s throw from the Al-Sheikh Hossain Habbanakeh mosque, with its twin minarets rocketing into the sky like glowing, green gate towers from the Wizard of Oz’s Emerald City, head-thumping techno is blasting out at a local fitness club. A dingy, low-slung basement affair, the Gold Star Sports Centre in south central Damascus has seen better days. A clumsily-taped poster of Syrian president Bashar al-Assad overlooks one of the bench presses in the weights room, while faded black-and-white prints of the club’s owner, Mohammad, a six dan former Syrian karate champion, are dotted around the walls. In one of the snaps he is suspended five feet in the air as if frozen in time, leg outstretched in a karate kick aimed at an unfortunate opponent’s wincing face. “I was national champion about 20 years ago”, reveals Mohammad proudly. 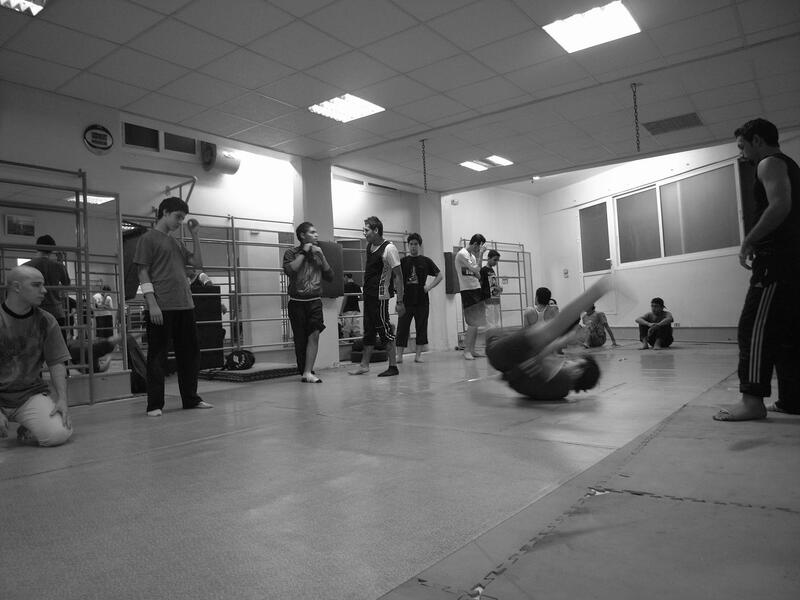 But that was then, and today the youngsters in his club aren’t here to fight: breakdancing is latest way to get their kicks. Ahmad Joudeh is a 20-year-old who runs dancing sessions three times a week at the Gold Star club. A classical performer by training, he now spends much of his time teaching eager youngsters how to body pop, head spin and kick step. Ahmad’s dream is to set up a club devoted solely to dance – classical, contemporary and the breakdancing he is teaching now. He says there are only two dance institutes in Damascus similar to the one he envisages, but both require end-of-secondary school certification for entry, effectively barring large numbers of youngsters who might want to learn how to kick their heels. There is only one problem – money. Ahmad does not have enough of it, but he is hoping help will come from an unlikely source – his teaching partner, Saeed Akkad, a Syrian breakdancing champion and quite possibly the star of the whole operation. Saeed is a gentle, smiling 26-year-old who has won a string of breakdance “battles” over the years. His left foot is currently in plaster, but Ahmad is hoping his friend might be able to pull off yet another victory so the duo can use the prize money to help start their club together. Saeed had better hope his run of form continues – the future of his and Ahmad’s dream might depend on it.